The low-budget Android phones come with a limited internal storage capacity. When you install an application, by default it installs on phone memory. With the passage of time, the space gets consumed. In that reason, the phone becomes slower, and you’ll unable to install a new app. The solution is that, you have to install android apps to SD card by default, or you can move android apps to external SD card without rooting. These two procedures can help you to free up your phone memory. Carefully follow the below steps to Install and Move your apps on External storage. Before going through the procedure, you must have to be done two things. After download, Extract it in your computer and navigate to adt-bundle >> sdk >> platform-tools. 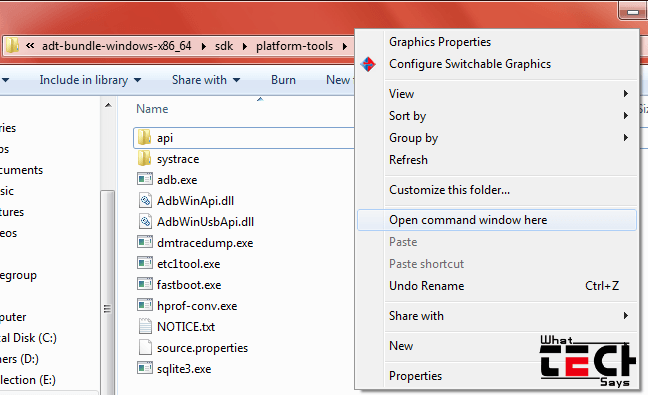 Launch the Command Prompt window in this folder by pressing and holding the Shift button, Right-clicking in the folder, and selecting “Open command window here”. 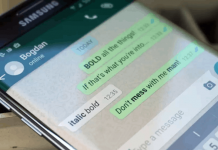 Now connect your Android device and run the below commands one by one. The “get-install-location” is only for checking the installation location. If it’ll show as “2[external]”, that means, now all of your apps will install on External memory card. To reverse the process, just put 0(auto) or 1(internal) instead of 2(external). If you have multiple devices connected to your computer, or you have installed an Android Emulator like “BlueStack”, then it’ll show an Error like, ”more than one device and emulator”. To overcome from this problem, first detect your device by running adb devices. Now run the below commands one by one. Just put “-s Your_Device_Name” after the adb command. That’s it. Now you can install Android apps to SD card by default without rooting. 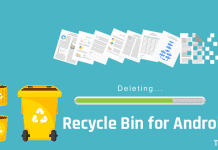 If apps are eating your phone’s memory, and you want free your storage space by moving Android apps to SD card without rooting, then follow the below procedure. 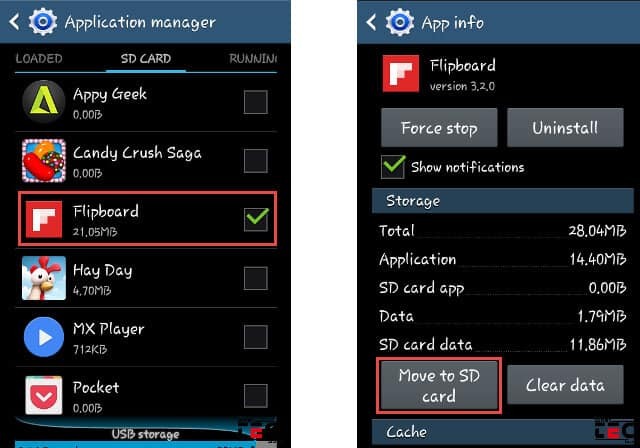 In order to move your apps, go to Phone’s Settings >> Apps/Application Manager and select “SD CARD” tab. Now click on an app, which you want to move. After that tap on Move to SD card button to move that application to external memory. 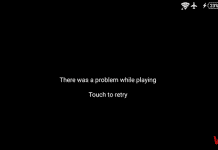 Some handsets, like my Sony Xperia Z2 and other z series handsets which run on Android KitKat 4.4.4 are unable to perform these two operations. Sony is strictly removed the external storage access for the security reasons. I have tested this on Lenovo, Motorola and Samsung devices, and it is working great. 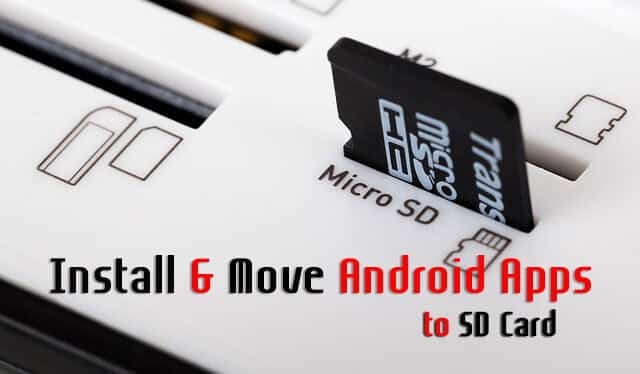 This is the easiest way to install and move Android apps to SD Card without rooting. If you have any question regarding this, then feel free to comment below. Thank you so much for sharing this amazing information .it helps a lot. Thanks again. I have a generic tablet, NID-1002, rooted, running Lollipop 5.1.1, it has an internal emulated SD card. I used the steps above setting the default to 2. Testing installation it still places all apps on the emulated card. When using 2 different APP2SD card applications, the apps tell me that my system has an “emulated internal SD card and cannot be moved”. Any thoughts? at first, i have a problem with permission.. all i did is disconnect the cable then disabling the "USB debugging" and enabled it again.. and ensure that there's enough space on your internal memory..
thanks for this post, it helps a lot.. i've experiences some bugs on rooted so i try to let it back into its original firmware.. If your phone is rooted, then it'll work on Kitkat. I was looking to avoid rooting. Will it work on my non rooted phone? HI , do you know if it would work on Lenovo s60 ? Which version of Android it has? My device is not listed bij sdb.exe. I put the phone in DevoperMode (android 4.4.2). Thats it. No devices while i'm sure the phone is connected. Hence the "Connect sound" from windows. Run command adb devices to check your device is connected or not. Can i apply this tutorial to my Huawei Y530 ? Do this work for my phone? Please answer. And after i do this how can i undo if this dont work?? Yes you can. If this process will not work for you, then set location to "0". 0 is the default setting. And AFAIK sm-g900a's with Android 5.0 can't be rooted. FML. After this, I got an "Unable to install Happy Chick app. Delete some items and try again" error. Then it will only direct me to the internal storage where I have 1.8 GB free space. My phone is Samsung Galaxy S Duos (gt-s7562) w/ Android 4.0.4. I tried almost everything to move apps to sd card but still no luck. I guess my phone/android ICS don't support ext sdcard. Could anyone help me to undo the adb shell and fix my original settings? Just put 0 for default setting. I'm having an issue where I've moved the app to the SD card, but every time the app auto-updates it seems to move it back to the device storage. Can this be fixed without going through the SDK download? Hello, I have an Xperia E, and I tried to install a new game on my phone, but it shows me that I don't have enough storage room, even after I did this procedure. I think it only downloads the app and then stores it on the internal storage, how can I avoid this? Some phones have restriction to use external storage. The common problem in Xperia E is the internal storage memory issue. If your internal memory app space is full, then you can't install in external also. If you have restriction, then you have to root your phone. Is it safe to do it? How can it damage my phone? I checked a site that said that it makes it easier to hack and can brick the phone. Edit: So with the right procedure, I can prevent my phone from bricking, right? It totally depends on you. When I bought Xperia Z2, on the first day I had rooted my phone, bcoz I know its benefits. Will it work on Lollipop phone? I use Sony phone, after the lollipop, move to sd card will appear but I wanted to know will it work? If this function is available in your phone then it'll sure work. By the way which model you are using? Hi Mr Chandan, Thanks for your tutorial. Can i get a copy of your version for the adt-bundle-windows_x86_64 Android SDK? Because when i download from website, it is not the version that what you teaching at this website. It not works at all. Can you share it with me for your version, maybe you can share it out to a link and i can download from there. Thanks. This is what shows up!…help me pls…asap!! My phone is Micromax unite 2 A106 running android 5.0! If it is showing this, then your device doesn't support it normally. You need to root it. my phone is micromax a120 with kitkat 4.4.2. i connect my phone and it is not listed when i execute adb devices. i have tried all usb options on the phone (MTP, PTP). I have google usb driver installed. Hey @rakeshauplish:disqus, if it is not working then search for Micromax A120 driver on Google and install it. Hope it'll work for you. is there any change that i can do like u do? if can, on what location should i type to make instalation folder on my real ext sdcard? 0 for Internal and 1 for External. Thanks dear for sharing this wonderful information in-depth technical learning along with images.